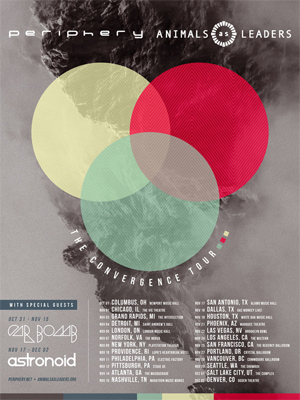 PERIPHERY and ANIMALS AS LEADERS team up for what is sure to be one of the year’s most talked about tours, launching a North American trek, dubbed The Convergence Tour, on Oct. 31. CAR BOMB opens Oct. 31 – Nov. 15 while ASTRONOID supports Nov. 17 to Dec. 2. Tickets for all shows are available this Friday, July 28 at 10 am local time.